As soon as I stumbled upon this galvanized canister in the Dollar Spot at Target, I knew I had to have it! Right away I thought, "PERFECT for BOX TOPS!" It's about the size of a Kleenex box... so it's big enough to hold hundreds of Box Tops but small enough to not take up much space in your classroom. To collect Box Tops in the school library or front office, just use a shoe box! Cover it with cute wrapping paper. Use an X-Acto knife to cut a hole in the middle of the wrapped box. My X-Acto cutting skills were awful today, so I disguised my crooked cutting with some washi tape around the edges of the hole. So cute & easy! 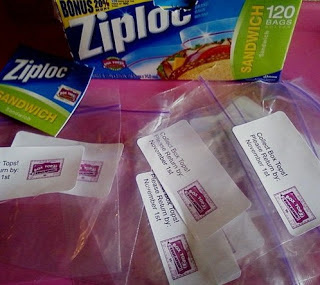 I love the idea of sending home a Ziploc baggie with a note that reminds parents to save their Box Tops and send them to school. Michelle from Michelle's Charm World suggests printing your note on an Avery label and sticking it on each baggie. LOVE IT! 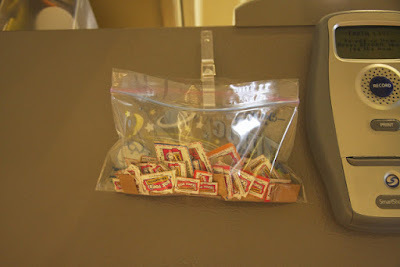 Samantha from Simply Organized clips her baggie to the side of her fridge. So easy to just slip the Box Tops inside the open baggie after you cut them out. I’m Liz! I am a former elementary school teacher turned stay at home mom to two wild and crazy boys. TheHappyTeacher blog provides teachers and parents with creative, fun, and inspiring ideas. 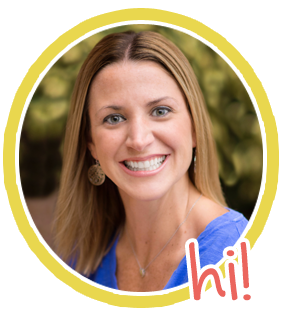 I love sharing teaching tips and tricks through my blog posts, videos, and time saving TpT resources. Here you will find classroom management tools, organization tips, as well as games, activities, printables, and worksheets for your K-2 classroom or homeschool.